The Kochi University of Technology (KUT) Special Scholarship Program (SSP) on research projects in the field of Engineering for International Doctoral applicants, Japan 2017/2018. The Special Scholarship Program (SSP) was established in 2003 in order to support the advanced research of the university by enlisting the help of highly capable students especially students from foreign countries. Every year in April and October, the university enrolls selected doctoral students for specific research projects. The students pursue the doctoral course in English (excl. Japanese students) while at the same time assisting their host professor as a research assistant (RA). Through this program KUT wishes to expand and deepen international ties with academic and educational institutions all over the world. The SSP student must work 50 hours per month for a specific research project at the university. The SSP student must report his/her study and research achievements to the dean of the Graduate School of Engineering at the end of each semester. The submitted report will be evaluated by the dean of the Graduate School of Engineering. To support living expenses, 150,000 yen/month is paid for research project work. Duration of sponsorship: Doctoral Program will last for 3 years. Scholarship: 1 year. The term will be extended for increments of one year up to a total of three years, unless the university terminates the SSP student status for any of the reasons stated in the Application Guidelines in the link below. 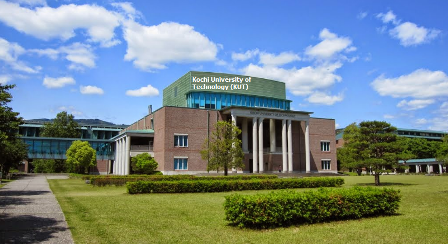 Now that all the information about Kochi University of Technology FULLY-FUNDED Scholarship Program for International Students has been delivered nicely; talented students who are eager to pursue their Free Tuition/Scholarships/Study in Japan for Bachelors, Postgraduate, Masters, PhD, Associate Degree and Other Degrees, can apply now. Labels: Doctoral Scholarship, Japan Scholarships, Master's Scholarship, Scholarship.